Stoke Mandeville is a village and civil parish in the Vale of Aylesbury in Buckinghamshire, England. It is located 3 miles (4.9km) from Aylesbury and 3.4 miles (5.5km) from the market town of Wendover. Although a separate civil parish, the village falls within the Aylesbury Urban Area. According to the Census Report the area of this parish is 1,460 acres (5.9 km2). Stoke Mandeville Hospital, although named after the village, is located on the parish's border with Aylesbury, has the largest spinal injuries ward in Europe, and is the birthplace of the Paralympic movement. The village was originally recorded as Stoches in the Domesday Book of 1086, from the Old English word stoc meaning an outlying farm or hamlet. The suffix Mandeville was first recorded in 1284 when the manor was listed as being in the hands of the powerful Norman de Mandeville family. The former medieval parish church on the outskirts of the village was condemned in the mid 20th Century and was demolished in January 1966. The newer red brick parish church of St Mary, consecrated in July 1866 by Bishop of Oxford Samuel Wilberforce, remains as the only church in the village apart from the Methodist church in Eskdale Road. Stoke Mandeville was also the location of the Stoke Mandeville Games, which first took place in 1948 thanks to doctor Ludwig Guttmann and are now known as the IWAS World Games. The Games, which were held eight times at Stoke Mandeville, were the inspiration for the first Paralympic Games, also called The Stoke Mandeville Games, which were organised in Rome in 1960. The wheelchair aspects of the 1984 Paralympics were also held in the village. The London 2012 Summer Paralympics mascot, Mandeville, was named after the village due to its legacy with the Games. Stoke Mandeville Stadium was developed alongside the hospital and is the National Centre for Disability Sport in the United Kingdom, enhancing the hospital as a world centre for paraplegics and spinal injuries. 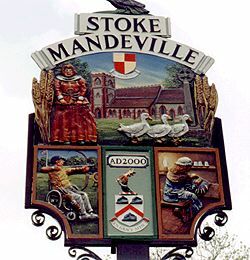 On 13 May 2000, the new Stoke Mandeville Millennium sign was unveiled. It stands on a small brick plinth on the green outside the primary school. The sign shows aspects of village life over the centuries. Stoke Mandeville railway station is on the London to Aylesbury Line between Aylesbury station and Wendover station, served by Chiltern Railways, which terminates at Aylesbury Vale Parkway northbound and London Marylebone southbound. Arriva Shires & Essex number 50 bus also serves the area on Station Road, as do services 164 and 300 - which stops in the centre of the village. Stoke Mandeville Combined School is a mixed community school which takes children from the age of four through to the age of eleven. The school has approximately 220 pupils. It also has a hearing impaired department, which currently helps up to 15 children through their school day. ^ "Millennium sign". radiolondon.co.uk. Retrieved 8 April 2018. ^ "Trains to Stoke Mandeville Station - Times - Chiltern Railways". www.chilternrailways.co.uk. Retrieved 8 April 2018. The A4010 is an important primary north-south road in Buckinghamshire, Southern England. It runs from High Wycombe at Junction 4 of the M40 motorway to Stoke Mandeville, near Aylesbury on the A413. A host of other athletes won individual gold medals including Allan Chadwick, Julie Dowling (athlete), Terry Giddy, Eric Magennis (with Roy Fowler), Michael Nugent, Jan Randles, Wayne Ryding and Peter Trotter. In the pool, coaching provided by Peter Carroll: Helena Brunner won 5 gold medals, Gary Gudgeon won 4, Greg Hammond won 3 and Rosemary Eames won 2. Blind and Vision Impaired athletes also benefited from a national organisation to organize competitions and raise funds. They performed well in track and field with Mark Davies winning two gold medals, Margaret Murphy winning a silver and bronze, and both Warren Lawton and Prue-Anne Reynalds securing bronze medals. Blind and Vision Impaired swimmers excelled. Medallist included Mary-Anne Wallace (gold, silver and two bronze), Kingsley Bugarin (3 silver and a bronze), Craig Blackburn (3 silver), Therese Donovan (3 silver and a bronze), and Mary-Anne Wallace (silver and two bronze medals). The first Australia's “Les Autres” athlete, Malcom Chalmers won a gold, silver and two bronze medals in swimming. The Cerebral Palsy Games (or CP Games) are a multi-sport competition for athletes with a disability, which under the former name of the International Stoke Mandeville Games were the forerunner of the Paralympic Games. The competition has been formerly known as the International Cerebral Palsy Games or the Stoke Mandeville Games. Since the 1990s the Games are organized by the organisation Cerebral Palsy International Sports and Recreation Association (CPISRA), so they called also CPISRA World Games. The Games were originally held in 1976 by neurologist Sir Ludwig Guttmann, who organized a sporting competition involving World War II veterans with spinal cord injuries at the Stoke Mandeville Hospital rehabilitation facility in Aylesbury, England, taking place concurrently with the first post-war Summer Olympics in London. In 1952, the Netherlands joined in the event, creating the first international sports competition for the disabled. In 1960, the Ninth Stoke Mandeville Games were held in Rome, Italy, following that year's Olympic Games. These are considered to be the first Paralympic Games. The 2012 Paralympic mascot Mandeville was named after Stoke Mandeville Hospital.While the Paralympic Games evolved to include athletes from all disability groups, the Stoke Mandeville games continued to be organized as a multi-sport event for wheelchair athletes. Games were held annually in Aylesbury under the direction of the International Stoke Mandeville Games Federation (ISMGF), which became the International Stoke Mandeville Wheelchair Sports Federation (ISMWSF). The German Democratic Republic (commonly known as East Germany) made its first and only Paralympic Games appearance at the 1984 Summer Paralympics in Stoke Mandeville and New York City, where it entered four competitors in athletics. East Germany never took part in the Winter Paralympics. Thus the country's tally at the 1984 Summer Games (three silver medals and one bronze) is also its all-round Paralympic Games tally.From 1992 onwards, a reunified German team competed at the Paralympics. Hungary made its Paralympic Games début at the 1972 Summer Paralympics in Heidelberg, with a delegation of four athletes in track and field. Following another appearance in 1976 the country was then absent in 1980. The Hungarian delegation made a permanent return to the Paralympics in 1984. Hungary first took part in the Winter Paralympics in 2002, and continuously attended the Winter Games through 2010. Hungary was absent from the 2014 Winter Games.Hungarians have won a total of 107 Paralympic medals (27 gold, 34 silver, 46 bronze), placing the country 32nd on the all-time Paralympic Games medal table. All of these medals have been won at the Summer Games.Arguably Hungary's most successful Paralympian is Attila Jeszenszky, who won four gold medals in swimming at the 1984 Summer Games. Hungary also boasts the only athlete in the world to have won medals at both the Paralympics and the Olympics. Fencer Pál Szekeres won a bronze medal at the 1988 Summer Olympics, before being disabled in a bus accident and beginning a Paralympic career in wheelchair fencing, which brought him six Paralympic medals - of which three gold. The International Wheelchair and Amputee Sports (IWAS) World Games (or IWAS World Games) are a multi-sport competition for athletes with a disability, which under the former name of the International Stoke Mandeville Games were the forerunner of the Paralympic Games. The competition has been formerly known as the World Wheelchair and Amputee Games, the Stoke Mandeville Wheelchair Games, the Stoke Mandeville Games, the World Wheelchair Games, and in the 1960s and 1970s was often referred to as the Wheelchair Olympics. The Games were originally held in 1948 by neurologist Sir Ludwig Guttmann, who organized a sporting competition involving World War II veterans with spinal cord injuries at the Stoke Mandeville Hospital rehabilitation facility in Aylesbury, England, taking place concurrently with the first post-war Summer Olympics in London. In 1952, the Netherlands joined in the event, creating the first international sports competition for the disabled. In 1960, the Ninth Stoke Mandeville Games were held in Rome, Italy, following that year's Olympic Games. These are considered to be the first Paralympic Games. The 2012 Paralympic mascot Mandeville was named after Stoke Mandeville Hospital.While the Paralympic Games evolved to include athletes from all disability groups, the Stoke Mandeville games continued to be organized as a multi-sport event for wheelchair athletes. Games were held annually in Aylesbury under the direction of the International Stoke Mandeville Games Federation (ISMGF), which became the International Stoke Mandeville Wheelchair Sports Federation (ISMWSF). In 1999, the World Wheelchair Games were held in Christchurch, New Zealand. In 2003, the Games were again held in Christchurch, and combined with a competition for amputee athletes organized by the International Sports Organization for the Disabled. In 2004, ISMWSF and ISOD merged to create the International Wheelchair and Amputee Sports Federation (IWAS). The first games held under the name IWAS World Wheelchair and Amputee Games were held in 2005 in Rio de Janeiro, Brazil. The second IWAS Games were held in 2007 in Chinese Taipei and the third IWAS games were held in Bangalore, India in November 2009. Iceland made its Paralympic Games début at the 1980 Summer Paralympics in Arnhem, where it fielded thirteen athletes, who won two medals (a gold and a silver). Since then, the country has competed in every edition of the Summer Paralympics.Despite its climate, and despite having participated in every edition (bar one) of the Winter Olympics, Iceland has been a highly infrequent participant in the Winter Paralympic Games. It made its Winter Paralympics début at the 1994 Winter Paralympics, sending just one representative, Svanur Ingvarsson in ice sledge speed racing. The country was then absent from the Winter Paralympics for sixteen years, before making its return at the 2010 Games in Vancouver - again with just one athlete, Erna Friðriksdóttir in alpine skiing.Icelandic athletes have won a total of sixty-one Paralympic medals, all at the Summer Games: fourteen gold, thirteen silver and thirty-four bronze. This places Iceland in forty-seventh place on the all-time Paralympic Games medal table. The International Wheelchair and Amputee Sports Federation (IWAS) is an international sports organisation that governs sports for athletes with physical impairments. IWAS is a registered charity with its headquarters located at Aylesbury College in, Buckinghamshire. and is the international governing body for the Paralympic sport of wheelchair fencing as well as the developing sport of Powerchair Hockey. IWAS provides support to developing sports and nations to cultivate the sporting opportunities available across the world. IWAS acts as a multi-sport competition organiser in the form of the IWAS World Games and IWAS Under 23 World Games. The International Wheelchair and Amputee Sports (IWAS) World Games programme are multi-sport competitions for athletes with a physical impairments, which under the former name of the International Stoke Mandeville Games were the forerunner of the Paralympic Games. Following the vision of its creator and founder, Sir Ludwig Guttmann, IWAS has continued to provide its 65+ international Members with competition and sporting opportunities to physically impaired athletes in maintaining its vision to "Inspire Worldwide Achievements in Sport". Netherlands competed at the 1984 Summer Paralympics in Stoke Mandeville/New York City, United States. The team included 61 athletes, 40 men and 21 women. Competitors from Netherlands won 135 medals, including 55 gold, 52 silver and 28 bronze to finish 7th in the medal table. Portugal made its Paralympic Games début at the 1972 Summer Paralympics (two years before the Carnation Revolution), where it was represented solely by a men's team in wheelchair basketball. They were eliminated at the preliminary stage of the competition, with one victory (over Switzerland) and three defeats. Portugal was then absent from the Paralympic Games until the 1984 Summer Games, where its athletes won the country's first fourteen medals, including three gold in track and field and one in boccia. Portugal has competed at every subsequent edition of the Summer Paralympics, but -almost uniquely among Western European countries- has never taken part in the Winter Games.Portuguese athletes have won a total of 92 Paralympic medals, of which 25 gold, 30 silver and 37 bronze. As of 2010, Portugal ranks thirty-sixth on the all-time Paralympic Games medal table. The country's best performance came in 2000, when it won 15 medals (of which 6 gold) and ranked 26th. Stoke Mandeville Hospital is a large National Health Service (NHS) hospital in Aylesbury, England. It is managed by Buckinghamshire Healthcare NHS Trust. The hospital's National Spinal Injuries Centre is one of the largest specialist spinal units in the world, and the pioneering rehabilitation work carried out there by Sir Ludwig Guttmann led to the development of the Paralympic Games. Mandeville, one of the official mascots for the 2012 Summer Olympics and Paralympics in London, was named in honour of the hospital's contribution to Paralympic sports. Stoke Mandeville Stadium is the National Centre for Disability Sport in England. It is sited alongside Stoke Mandeville Hospital in Aylesbury in Buckinghamshire. Stoke Mandeville Stadium is owned by WheelPower, the national organisation for wheelchair sport. Stoke Mandeville railway station serves the village of Stoke Mandeville, south of Aylesbury in Buckinghamshire, England. The station is on the London - Aylesbury line and is served by Chiltern Railways trains. It is between Wendover and Aylesbury stations. Both station platforms have step-free access. Trinidad and Tobago made its Paralympic Games début at the 1984 Summer Paralympics in Stoke Mandeville and New York. For its first participation, the country sent eight athletes (seven men and one woman) to compete in athletics, swimming and weightlifting. Its three medals (two gold and a bronze) were all won by the same athlete, Rachael Marshall. The country competed again in the 1988 Summer Games, with a reduced delegation of four athletes (all men), in athletics, table tennis and weightlifting. They won no medals. Trindad and Tobago returned to the Paralympics in 2012, and has never participated in the Winter Paralympics.The country's three medals (of which two gold) place it 72nd on the all-time Paralympic Games medal table. The United Arab Emirates started actively participating in the Paralympic community during the 1990s. They made their debut at the 1992 Summer Paralympics. Since that time, they have won several Paralympic medals. The country had their debut on the international Paralympic stage at the 1990 Stoke Mandeville Games. Some of the country's Paralympic competitors are internationally ranked. The United Arab Emirates have competed at several other Paralympic events including the Arab Paralympic Games, Asian Paralympic Games, IWAS World Games, Stoke Mandeville Games, and World Semi-Olympic Championship. (The country has never participated at the Winter Paralympic Games.) The United Arab Emirates Paralympic Committee is the national organisation, gaining its International Paralympic Committee recognition in 1995 and have subsequently made winning medals and hosting events a priority.